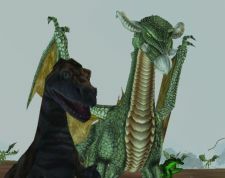 Massively Speaking Episode 29 is entirely about EverQuest: Seeds of Destruction! Well ... almost entirely. Join Shawn and Michael for a few moments of talk about the WoW Zombie event, and then right into an extensive interview with Ryan Barker and David Ford of the EQ design team. Listen in as we talk about the launch, the goals of the expansion, and the future of this august franchise! Massively Speaking Podcast Episode 29 originally appeared on Massively on Wed, 29 Oct 2008 15:45:00 EST. Please see our terms for use of feeds. That NPC tanks and healers feature just floored me, what a clever idea. Blizzard need to step up. Great show btw. I have not played the new NPC hiring thing ,but it sounds a lot like GW. I just hope thay did a better job on them.